The Corangamite Region has the following soil orders. These soil orders have been classified using the Australian Soil Classification. Broadscale overview soil maps are presented for each soil order and should only be used as a general indication of their distribution. These maps have been developed from work completed by DPI's PIRVic Division as part of the Corangamite Land Resource Assessment Project (Robinson et al. 2003). This project utilised existing surveys (such as Maher and Martin,1987), remote sensing information and additional field work to develop an updated 1:100 000 scale soil/landform mapping coverage across the region. A number of soil surveys have previously been completed in this region at varying scales and intensity. Details about these can be found in the Soil and Land Survey Directory. Road cutting near Bacchus Marsh showing basalt flow overlying an older Tertiary soil profile. There are six main Soil Categories in the Corangamite Region and these are listed below. Each of these Soil Categories contain one or more Soil Orders. In the Corangamite region, there is a range of soils with strong texture contrast, previously referred to as Duplex soils using the Northcote Factual Key. Kurosols have clay subsoils which are strongly acid (i.e. pH <5.5 in water). Their surface texture ranges from loam to fine sandy loam over a clay subsoil. 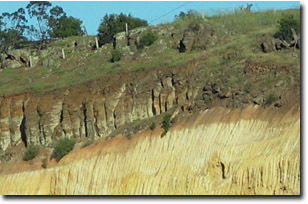 Brown and yellow Kurosols are most prevalent on the sedimentary hills and rises to the south of Ballarat and on some of the less steep hills in the Otway Ranges, to the north of Lorne. They are most likely to occur in areas with average annual rainfall of over 600 mm. Chromosols have clay subsoils which are not strongly acid (i.e. pH >5.5 in water) and are non-sodic. Their surface texture ranges from loam to fine sandy loam over a clay subsoil. Chromosols are most common on sedimentary plains and rises in southern parts of the Corangamite region (e.g. Bellarine Peninsula, south-east and south-west of Colac). Chromosols also occur in some areas on basalt and volcanic ash/scoria deposits (where they often have dark subsoils). Sodosols have subsoils which are not strongly acid (i.e. pH >5.5 in water) but are sodic. Their surface texture ranges from sandy loam to clay loam over medium to heavy clay. Sodosols are common on basalt plains and rises throughout much of the region. They are also common on sedimentary plains and rises south of the Princes Highway in lower rainfall areas. Dermosols are non-texture contrast soils, which have moderately deep and well-structured subsoils. These have mainly developed on marl and volcanic ash deposits, and are also associated with stony rise landscapes. Acidic, Brown Dermosols are common on many of the steep slopes of the Otway Ranges. Yellow and Grey Dermosols (which tend to be calcareous at depth) occur on rises and plains associated with marl deposits in the south-western parts of the region. Very shallow and stony Dermosols (which can be black, red or brown) occur on the stony rises surrounding Lake Corangamite and to the north and south of Derrinallum. Kandosols differ from Dermosols in that they have minimal structural development in the subsoil and tend to be ‘earthy’ in appearance. Kandosols are not widespread in the region. They mainly occur on some hills south of Colac and near Port Campbell and Anglesea, as well as on some more recent floodplains. Ferrosols are deep, well-structured and friable soils that have formed on basalt. They are high in free iron oxide and clay, and are generally strongly acid. Red Ferrosols are common on the basalt plains and rises to the east of Ballarat. These soils are friable and well structured and are frequently used for cropping. In some areas, they can be quite stony. Clay contents are quite high on these soils and they have limited shrink-swell characteristic which makes them prone to compaction if over-cultivated. These soils are referred to as Vertosols using the Australian Soil Classification. These are clay soils that shrink and swell significantly during wetting and drying cycles, and crack as the soil dries. They are reasonably common throughout the region - especially associated with basalt on volcanic plains and on the slopes of some volcanic hills. There is a range of sandy soils in the region which can vary between deep sands and sands overlying clays. Podosols are reasonably common in the southern parts of the region. These are strongly acid, bleached sands that have subsoil accumulations of iron/aluminium and organic materials (commonly referred to as “coffee rock”). These soils are referred to as Hydrosols using the Australian Soil Classification and are saturated (waterlogged) for a number of months in most years. They commonly occur in swamps and lower-lying depressions in the region. Many of the soils in the region can be calcareous in the subsoil (especially Sodosols and Vertosols developed on basalt and Dermosols developed on marly deposits). Calcarosols, however, are soils that do not have strong texture contrast between surface and subsoil horizons and are calcareous throughout the soil profile. These soils are restricted to some coastline areas in the Corangamite region. Maher, J.M. and Martin, J.J. (1987). Soils and landforms of south-western Victoria. Part 1. Inventory of soils and their associated landscapes. Research Report Series No. 40. Department of Agriculture and Rural Affairs. Robinson, N, Rees, D, Reynard, K, MacEwan, R, Dahlhaus, P, Imhof, M, Boyle, G and Baxter, N (2003). A land resource assessment of the Corangamite region. Department of Primary Industries.